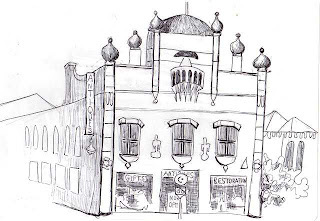 I have started a few sketches of skylines around Geelong, the first one being of Moorabool Antiques (which is in Ryrie Street) - a biro sketch but I'll do others using colour. It has quaint decorative shapes so I don't know what the architect was dreaming of at the time. Arnold Zable gets it right in an article in today's Age about the silly citizenship test, a legacy of the Howard government. I hope it will soon become a feather duster, though not likely. Why ask a prospective citizen, who may have come from a refugee camp in Sudan, what did Donald Bradman do? If I was in USA and did a similar test, would I be asked who Babe Ruth was? Maybe a pink pig in a movie, I would answer! Zable suggests that conversational English classes be funded rather than running tests that apparently have really stalled applications for citizenship. The full article by Arnold Zable can be found here. We went to Tullamarine airport last night to pick up Peceli after his nearly four weeks in Fiji. First though we watched the tennis finals on TV for two sets, listened to the next set on the radio as we drove up to Melbourne and then I watched the last disappointing moments on the TV at the Arrivals (a huddle of watchers with me, neglecting to look out for our loved ones as we barracked for Tsonga, but also he did not win.) Peceli arrived all smiles as he had travelled very well with Air Pacific on the Island of Taveuni plane. Before leaving someone had called out his name, and upgraded him to Business Class! Who? He doesn't know who or why. It's not as if he is a millionaire or something. It was funny because one Geelong millionaire and his family were seated in sheep-class down the back of economy, a guy who owns an island resort near Nadi! Anyway today is supposed to be a rest day, but Peceli had to make an urgent pastoral call to a patient in the hospital. And now the phone has been playing 'I wish you a merry christmas' all day, people visiting us, and more will be arriving soon for kava, and there's an invitation for tonight somewhere! Anyway Peceli can write his own comments - when he has time! 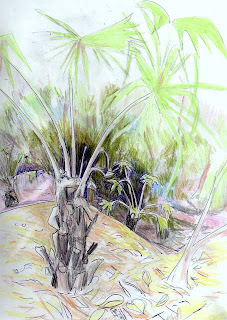 This drawing goes with a post on the Babasiga blog about making kokoda for a party yesterday. Kokoda is a kind of raw fish recipe where the diced flesh is marinaded in lemon juice overnight, then mext day the fish doused in coconut cream. We have a coconut scraper made for us by a Maori friend. 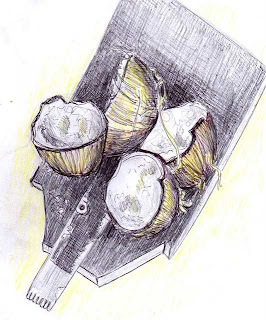 You sit on the scraper, perhaps on a verandah or seat, and the bowl is below to catch the coconut as you scrape. Then you squeeze and squeeze to make the cream and eventually discard the dregs. If the coconuts are broken neatly, you can make bowls from them for drinking yaqona but it's a lot of hard work with a piece of broken glass! It's the Australia Day weekend with a holiday tomorrow, though yesterday was the real day. Okay, is it un-Australian to think that our national anthem isn't up to scratch because it's inaccurate, full of hyperbole and has silly words such as 'girt' in it? 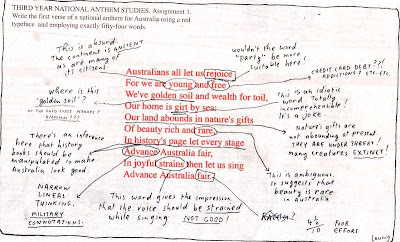 Is it un-Australian to laugh as perhaps even cry at Michael Leunig's take on the anthem in this cartoon of a poetry student being assessed? You might need to click on the picture to be able to read it easily. We like to be subversive perhaps as we regard the folk song 'Waltzing Matilda' as our national song. It's about a homeless loser who camps under a gum tree, gets hungry so pinches as sheep, barbecues it and almost gets caught by the officers so he leaps into a murky swamp (a billabong) and that's the end of him! Other songs we like are 'I still call Australia home' particularly if we are overseas, and also that song the Seekers made popular which starts, 'We are one but we are many' - about being a multicultural society. Way to go. Usually I chuck advertising material straight into the recycle but this one caught my attention, the 2008 Quilt Convention coming up in Melbourne. I went last year and saw so many beautiful examples of women's crafts though it was really, really crowded with enthusiastic quilters. 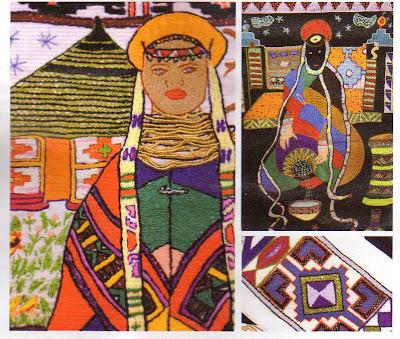 This time the exhibition will include some South African embroidery from the Kopanang Project for village women affected by the HIV/AIDS virus. This group recently received a commission for 13 wall hangings for Oprah Winfrey's South African school for girls. Another things I noticed in the brochure was a competition to make quilts for 'Under Flynn's Wings' - as it's eighty years on since the commencement of the Flying Doctor Service in Australia's inland. A nice mix of craftwork with the history of the Presbyterian / Uniting Church's national mission to the inland. Who is this French tennis player? THERE was a moment during last night's Australian Open boilover that said much about the free-form, energetic spirit of young French player Jo-Wilfried Tsonga, the giant-killer who may now face Roger Federer. The unseeded 22-year-old last night beat world number two Rafael Nadal in three extraordinary sets, 6-2, 6-3, 6-2. 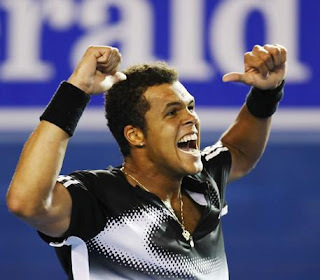 The match was full of raw, unbridled power from Tsonga, a Frenchman with Congolese heritage. As he went 5-3 up in the crucial second set — with an almighty, boastful smash, he punched the air, danced on the spot then swaggered around his end of the court, prowling Rod Laver Arena like a victorious boxer punch-drunk on his own brutal power. Tsonga is nicknamed Muhammad Ali on the men's tennis circuit because of his uncanny resemblance to the famous boxer. But when he swaggered across the court like he did, dancing to his own beat, the likeness is more than just looks, it's the whole package. The Rod Laver Arena responded, and surged with him. Large sections of the 15,000-strong crowd were on their feet to support him. Here was a fresh young player with attitude, character and a phenomenal game taking on a triple French Open winner and not only beating him but taking him apart bit by bit. Nadal has never suffered such a defeat. 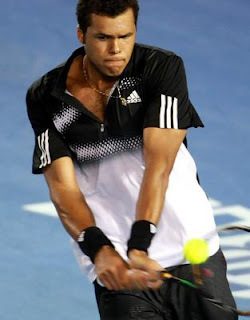 So Tsonga swaggered and danced but he had more to do, and his next move was audacious. He was serving for the second set having already won the first. To win the set would give a good shake at the biggest match of his life. 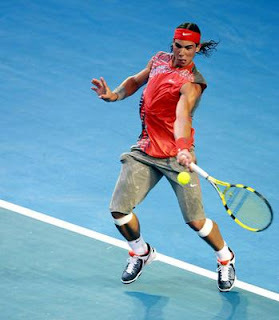 Nadal had wandered off to change racquets as a slowdown tactic, but it didn't work, Tsonga's first serve was an ace. So was the second, at 202 km/h. Then the third — another ace, even after a challenge — at 221 km/h. He won the set. It's fair to say that Jo-Wilfried Tsonga's life changed at that moment. His tennis was just like this throughout the match: carefree, brave. It was as if he didn't care about the score or his famous opponent, he just wanted to hit the ball as hard as he could to wherever Nadal wasn't. He felt, he said, as if "nothing could stop me". It was, he said, "like a dream. I can't believe that it is true." Tsonga now meets the winner of tonight's semi-final between Roger Federer and rising Serb star Novak Djokovic in Sunday's final. He was unfazed. On last night's form he could beat anyone who dared to take him on. Asked about his two possible opponents, he said: "Both of them have two arms and two legs like me. So we will see." It's time I started some large paintings based on the sketches and variations I have made but laziness gets in the way. 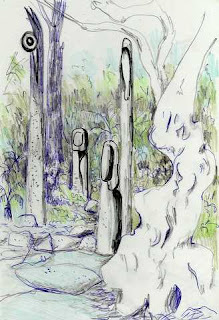 Here are some variations of some of my sketches, including the buddha garden, some seedpods, and buoys at the Geelong waterfront. 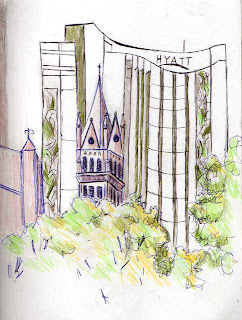 Usually I walk quickly to a bus stop or on an errand but the task of drawing in the local streets has slowed me down to notice more details. For example there is a flowering eucalyptus tree three houses down, on the roadside, but... there is an ugly electricity pole right next to it. 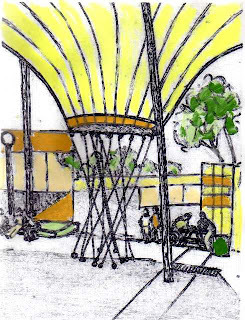 What was planted first - the tree, or the pole? In Geelong poles and wires are necessary I suppose, but in some newer suburbs I believe they are putting them underground. On the other hand, sometimes, just sometimes, there is a beauty about a detail or object designed for a purpose that is almost sculptural. 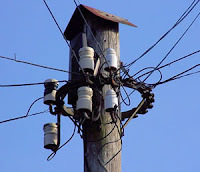 I found two power poles by a google search that look like modern sculpture. Thee was a reference to 'potheads' and 'terminators' which I thought was interesting! Also I like the look of power towers stalking across the land, such as on the drive to Anakie. 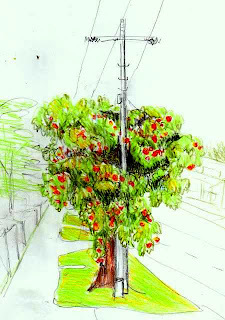 I saw this 'Dancing Tree' in Wilson Road when on the way to the library. 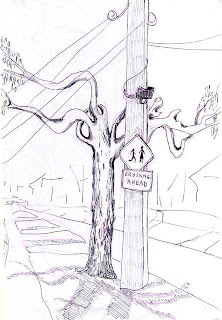 It seemed to be dancing with the electric pole! Another strange juxtaposition that the local planners don't seem to bother about. I think the convoluted branches were caused by someone who lopped the tree very drastically at one stage and it objected! Tonight we drank kava at a friend's house and now it's 11 p.m. but very hot in the house so I've been checking email etc. 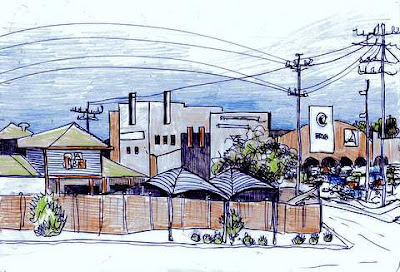 Today I did some variations on two pictures I sketched when I went up to Melbourne on Wednesday. Watercolour. One - looking at the sail through the window of a cafe at Melbourne University and also the old Melbourne Teachers' College near the corner of Grattan and Swanston Streets. 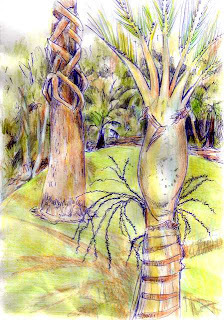 Okay, that song is in my head as I scan some sketches from my walk around the fern glades area of the Geelong Botanical Gardens a few days ago. (Note; this blogsite gets the dates wrong - it's on American time perhaps, a day early). It's usually a beautiful area but at present many of the fern tips are brown and the drought has really impacted upon the growth. 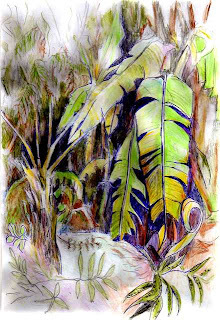 These three pics were made using watercolour pencils, biro, and bit of water slapped on. I must ban the biro in the next pictures I do as I get carried away with scribbling and over-do it, then the pictures becomes heavy-handed. Yesterday in Melbourne I traipsed around the city and then Carlton. 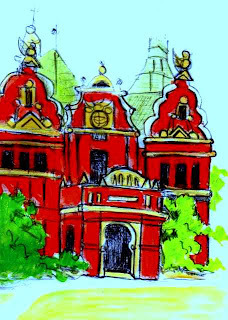 Yesterday I set myself four tasks with a train trip up to Melbourne (one hour away – and only $7.50) to buy music books at the Uniting Church bookshop for our local Geelong East church, to make some quick sketches around Melbourne on the way going some place or other, to wander around Melbourne University, find the Union and eat there and check out the art history book fair associated with the Congress on History of Art, find the Rathdowne Tavern in Carlton to meet with a dozen or more former art students at our second reunion. Then took the tram up to Melbourne Uni, found that my old corner café where we used to buy Danish pastries and cinnamon scrolls was now a Kentucky! 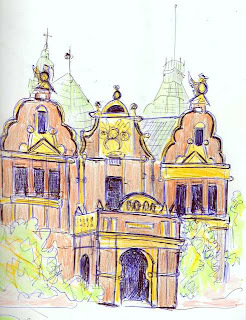 I sketched my old Teachers’ College with its ornate fake baroque twists and twirls and even the griffen emblem on top. Then I meandered through narrow streets to find the Union building, up many stairs to see the art book fair and great posters on what research students are investigating these days. 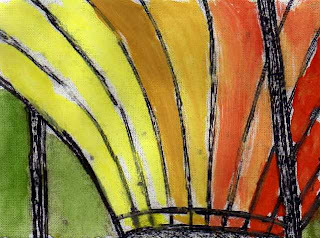 Then I was starving so bought wedges and Fanta and sketched the sail through the window. The old cafeteria is gone and there are now numerous food bars. On the train journey I had yacked for an hour with a friend (about my age) who is at last studying at Deakin Uni. (When she was a teenager the kids at her school were told that if their father worked in a factory they could forget about tertiary studies! How gross is that, with such a class system. Thank goodness at my little country high school the whole ten of us in Form 6 went to the city for further studies!) Anyway she said to check out the Potter Gallery at Melbourne Uni (not the Potter down at the bottom of Swanston Street). So I did so – two more flights of stairs and besides the rather bizarre stuff about the composer Grainger, and detailed botanical and bird paintings, I found the Heavenly Things kind of exhibition. 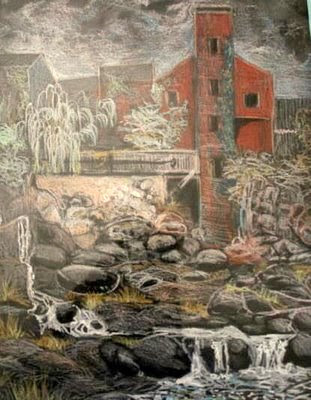 Glorious Starry Night paintings by Asher Bilu and even paintings by Ema, the Aboriginal woman. But…. a door was open and inside were some of my friends amidst the gleaming tables, a marble bar, and chandeliers dripping from the ceiling. 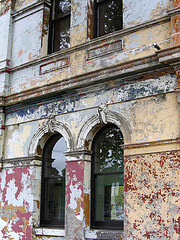 What a put-on job with the outside all peeling paint! Anyway about 15 of us laughed and cried a bit remembering earlier times, missing friends, and illness had caught up with some and we passed around old and new photos. One old photo of a beach picnic with us glossed up, looking glam, sent us into reels of laughter as we remembered those art student days. 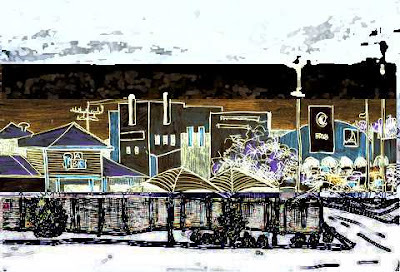 I caught the train by 4.55 p.m. and was rather footsore and weary after a super day of remembering the old, discovering the new, a real mix of nostalgia and the sudden wake-up reality of my friends and I all getting older. 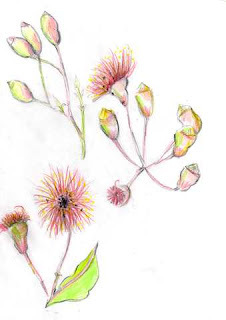 It's a nice day so I walked around the Geelong Botanical Gardens this morning with my sketchbook, pencils and pens and besides swotting flies and mosquitoes, made a few scribbly sketches. 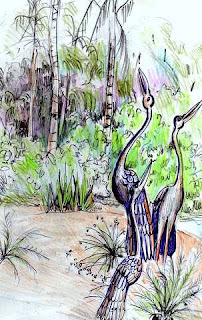 Here are the first three - the ginkgo tree, the sculptures in the fern gully and a very bendy peppercorn tree, the other of the bronze birds from Japan in front of bamboo and palm trees. There's no local hero quite like William Buckley. 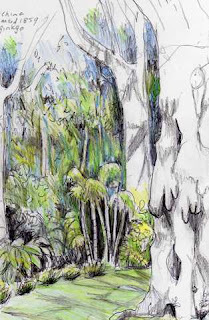 I've cobbled together a kind of bio of his life here, plus posted a painting I did of Buckley's Falls and two pictures about Buckley I found on the internet. The 'wild white man', was born at Marton, Cheshire, England, the son of a small farmer Because of his great height, 6 ft 6 ins (198 cm), he joined the army. In 1799 he served in the Netherlands and was wounded in action. After his return to England, he was convicted at the Sussex Assizes on 2 August 1802 of having received a roll of cloth knowing it to have been stolen, and was sentenced to transportation for life. 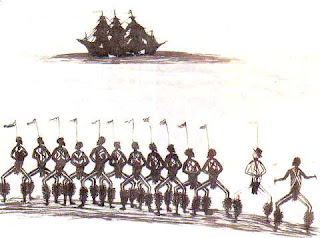 He was taken to Port Phillip in April 1803 in the Calcutta and there he and two companions absconded from the camp. Buckley wandered around the bay, along the coast to what was to be later called Breamlea, Torquay, Anglesea and Aireys Inlet. His first permanent resting place was near Mount Defiance (between Lorne & Apollo Bay) where he found an abundance of shellfish, edible vegetation and natural cover. It was here that his contact with the Wautharong Aborigines began. The local tribes knew him as Murrangurk. On his travels he had picked up a spear from a grave site to use as a walking stick. This spear had belonged to the aboriginal Murrangurk. The locals believed Buckley to be reincarnated as a white man. The name Murrrangurk has also come to mean 'back from the dead'. For the next three decades Buckley wandered extensively throughout the region, living with local tribes who took him in as one of their own and taught him to hunt and live as they did. Most of his years on the run were spent around what is now Geelong, through the Otway Ranges and along the coast near Barwon Heads. 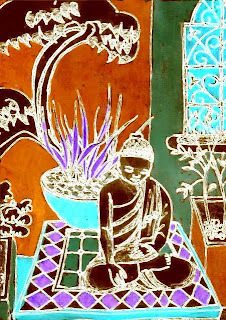 He learnt their language and their customs, and was given a wife, by whom, he said, he had a daughter. Gellibrand sought knowledge from Buckley about the Aboriginal communities he had lived with. 'It appears from his statement that the Tribes are most peacably disposed [and] that they fully understand the nature of the Grants issued by them… I am quite satisfied that he can only be acted upon, by kindness, and conciliation, and by those means he will be an Instrument in the hands of providence in working a great moral change upon the aborigines'. 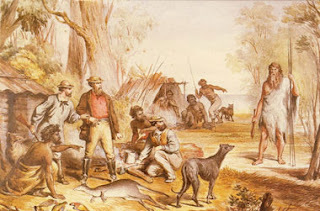 On 4 February, William Buckley accompanied Gellibrand and his party on a trip west from Melbourne, heading toward Geelong, where they met with a group of Aboriginal people with whom Buckley had lived. William Buckley was confused in his loyalties, and felt that neither the Aboriginals nor the whites trusted him entirely. Unhappy and disillusioned, he left for Hobart in December 1837. He became assistant store-keeper at the Immigrants' Home, and from 1841 to 1850 was gate-keeper at the Female Factory. He retired on a pension of £12 to which the Victorian government added £40 a year. In 1840 he had married Julia Eagers, the widow of an emigrant. Buckley died at Hobart in 1856. To put the story of white/Aboriginal contact here is a timeline of Aboriginal heritage and decimation in Victoria - on this website. I really want to attend a conference next week at Melbourne but the cost is prohibitive for me, even for a one-day ticket, so I'll just go along to their book fair on Wednesday morning before our art students reunion. The conference is a huge affair, the first south of the Equator - 32nd Congress of the International Committee of the History of Art, an Olympics of art history and the theme is Crossing Cultures; Conflict, Migration and Convergence. I want to attend the day where they focus on Australian indigenous and Pacific art but I'd better pay the phone bill instead! The picture here is by an Aboriginal artist Tommy McCrae from 1890 of the 'white' man, William Buckley dancing in a corroboree. He lived with the Wathaurong tribe for 32 years and around Geelong there are numerous significant places that refer to him (such as Buckley's Falls) which I can post some time. 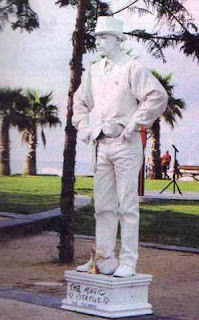 Where has the White Statue man gone? But I haven't seen him around lately. 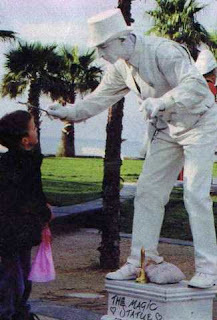 I wonder if he ever got to Paris to see his idol, the mime artist. 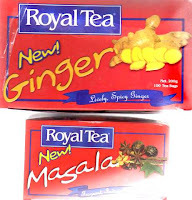 It's going to be about 40 degrees centigrade today in Geelong and I'll give coffee a miss, and go for Royal Tea, Masala or Ginger. My daughter-in-law from Fiji visited recently and brought some packets of tea (from Sri Lanka imported into Fiji by CJ Patel in Suva). Both very nice. We drink a variety of tea - from Earl Grey, herbal teaq, to no-brand tea, but these two - ginger and masala are the best for a hot day. The sea, where is the sea? Despite our protesting, the Yarra Street development is going on with Westfield spending hundreds of millions of dollars to 'upgrade?' the area for bigger and 'better?' supermarkets, etc. 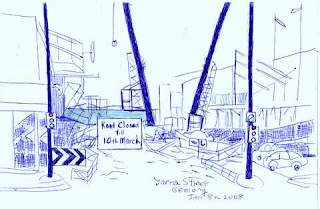 The sea, which should be the focus of the vista will hardly be visible when a glass bridge is built over Yarra Street. 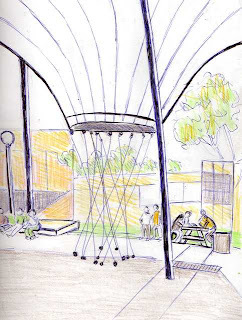 Yesterday I went to the revamped Newcomb library to take books back, and while waiting for a bus later, did a sketch of a view of the new children's centre, library, Aldis (or is it Audis) and the shopping centre is now called Centro. 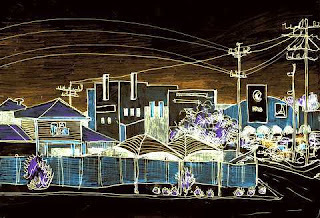 Mucked about with the sketch later using my ancient Photo-edit program. I really don't like large supermarkets, would rather support small family businesses but there isn't much choice these days. One green-grocer went out of business when Audi's (or whoever) set up with cheaper products. 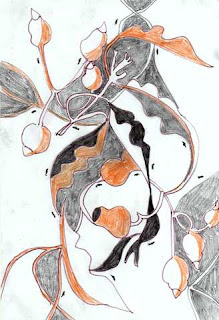 Today I picked some leaves and flowers from a tree near the road and examined the shapes and patterns. 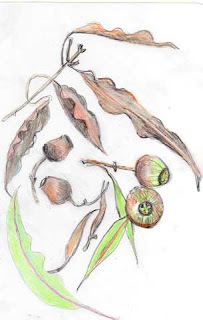 The brown leaves and gumnuts were as interesting as the greener leaves and flowers. I was surprised to find that the black inside the flower was in fact scores of little black ants! 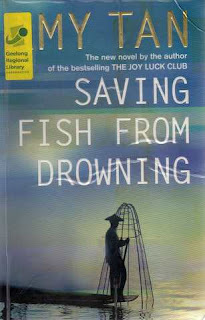 Since Christmas I've read three books: Amy Tan's Saving Fish from Drowning, Sia Figiel's They who do not grieve and Graeme Kinross-Smith's Long Afternoon of the World, all quite different. Tan's is about a disparate group of American tourists who are kidnapped in Burma, told from a magical point of view - that of a ghost, very nicely written and detailed. But I was annoyed by the know-all ghost and the ending was very rushed. 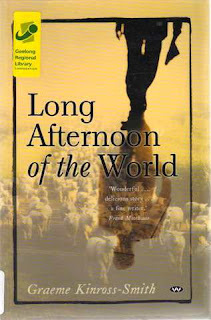 It took me a long time to read this book of 474 pages. 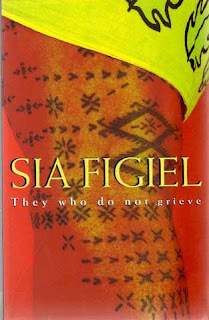 Figiel's is a feminist book about Samoan women, graphically told by a young Pacific writer, and life is not pleasant at all for the women, in fact quite horrible. It certainly subverts the idea of a happy paradise on a South Pacific island. 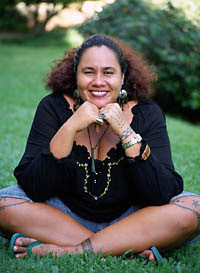 I met Sia one time at a writers' program in Suva. The Geelong writer's book, written in the first person, present-tense, examines memory and is built up of short poetic-like descriptions and mini-stories. It is a portrait of a middle-aged Ausralian man. The sense of place always there, whether it is the Mallee, Melbourne, or near Port Campbell. To a large extent it is autobiographical I'm sure. This is a book that can be dipped into for the beautifully written fragments.